Sometimes I don’t even know where to start. In his latest column, the Mar Vista Community Council’s self-appointed traffic planner/dermatologist Kenneth Alpern says it’s time to stop all the lies and abuse on Venice Blvd. Which I assume means he won’t be writing anymore. Especially since he doesn’t seem to have a problem co-opting the #TimesUp movement for something that has nothing to do with sexual harassment. Never mind that he’s the one who’s been dishing out abuse towards anyone who disagrees with him, particularly Mayor Eric Garcetti and Councilmember Mike Bonin. Then again, that comes with their jobs. But it doesn’t — or at least shouldn’t — be part of the job description for LADOT Principal Project Coordinator Nat Gale, who has been subjected to repeated accusations and character assassination at Alpern’s hands. Simply because, like the other traffic safety deniers who’ve been fighting the Mar Vista Great Streets project for the past year, Alpern chooses not to accept the established science behind road diets and protected bike lanes. They also reject out-of-hand any stats that come from LADOT. Not because they have any credible evidence to refute them, but simply because the facts don’t align with their pre-established biases. So let’s look at just a few of the inaccuracies in his latest screed. Because it would be rude to call them lies, even though that’s what they are. So …TIME’S UP! Enough of listening to the hundreds of taxpaying citizens, and overwhelming majority of the community, have their good will and patience and collective voice snuffed out because of a few activists who believe in crushing the voices, safety, and quality of life of that overwhelming majority (which includes the overwhelming number of bicyclists who do NOT support this project). Seriously, show me one survey that supports his argument that the overwhelming majority of the community opposes the road diet on Venice Blvd. Especially since public opinion at his own community council meetings has been evenly split on the subject. And never mind that he has absolutely zero basis to claim that most bicyclists, let alone an overwhelming majority, don’t support the project. I’ve personally heard from a few bike riders who oppose the project, compared to dozens who support it. TIME’S UP! Enough of the false LIE that half of the community wants the Venice Blvd. Road Diet, when at best only 10-20% want it and everyone else hates it, and wants it reversed NOW. To the best of my knowledge, there has been no survey of the general public to determine how many support or oppose the project. If he has any valid stats to back up his claim, let him produce it. TIME’S UP! Enough of the constant and daily accidents and near-accidents that endanger motorists, pedestrians, and bicyclists, including and especially children! Again, if he has valid stats to back up his claim, let’s see them. Otherwise, let’s wait until LADOT releases the actual, factual stats at the end of the full year of the pilot project, which concludes this week. And I have to wonder just how many people have been killed or injured as a result of those constant near-accidents. TIME’S UP! Enough of a reconfiguration that was not done in compliance with ADA/disability community laws and legal requirements! If any of that is true, the city would be required to make any necessary changes to bring the project into compliance. And probably subject to numerous lawsuits already. TIME’S UP! Enough of a reconfiguration that shredded over a decade of community input for what was supposed to be a beautification effort on Mar Vista, and which was (despite the LIES to the contrary) imposed in the dead of night without ANY true input or debate! We’ll let Streetsblog’s Damien Newton refute that. Bonin and a band of neighborhood and business advocates have used the Great Streets Plan for Venice Boulevard in Mar Vista (roughly between the 405 and Lincoln Boulevard) as a sort of Livable Streets master class to educate people about what a street can be if it is reimagined as something new. The presentation of the image boards showing the various Great Street options at both the “usual suspect” locations (Farmers’ Markets, the Mar Vista Community Council, and Mar Vista Chamber of Commerce) and high schools, libraries, coffee shops, and markets allowed a wider range of stakeholders to weigh in on the proposed changes. That was written nearly three years ago. And a full 21 months before the road diet was installed. You would think that a community council member like Alpern would know what’s going on in his own community. But evidently, you’d be wrong. Then again, you’d also think Alpern would know what the hell is going on with his own community council, since LADOT lists 12 community events where the project was discussed prior to installation — including two years of attending the Mar Vista Community Council’s Great Streets Ad Hoc Committee meetings. TIME’S UP! The number of bicyclists using the “protected” (but with lots of blind intersections) bike lane is very small, while both commuters and bicyclists avoiding Venice Blvd. in Downtown Mar Vista is very high, and stop pretending it’s otherwise! So show us the bike counts. Or any other factual basis for this claim. Then again, if commuters are avoiding the street, why do traffic safety deniers continue to claim it suffers from soul crushing congestion? Of course, the question is why Alpern and Restore Venice Blvd’s Selena Inouye are using such false and unsupported claims to demand the removal of the road diet before the official stats for the project have even been released. For some reason, they seem to be unable to wait a few more weeks for the stats to be compiled. Possibly because they suspect the real statistics won’t support their claims. And want to poison the waters before LADOT can tell us what’s really going on. So let me be clear. If the facts back them up, and the road diet has actually made the street less safe for bicyclists and pedestrians, I will be the first to demand changes. Even if that means acceding to their wishes, and restoring the boulevard to its original dangerous and destructive configuration. But I suspect they won’t. And I suspect they suspect that, too. A new study from the Insurance Institute for Highway Safety examines the rapid increase in pedestrian deaths in the US, which have gone up 40% more than other traffic deaths in recent years. However, it’s unlikely that Ken Alpern or the rest of the Restore Venice Blvd/Keep LA Moving crowd will like their conclusions. Pedestrian fatalities have increased precipitously since reaching their lowest point in 2009. To have the largest effect in halting the escalation in pedestrian fatalities, countermeasures should be implemented where the rise in fatalities has been greatest. Specifically, transportation agencies can concentrate efforts on improving urban arterials, which represented nearly two thirds of the increase in fatalities during 2009–2016 and on which about half of pedestrian fatalities occurred in 2016. Transportation agencies can improve urban arterials by investing in proven countermeasures, such as road diets, median crossing islands, pedestrian hybrid beacons, and automated speed enforcement. Better road lighting and vehicle headlights could improve pedestrian visibility at night. Of course, that will only work if our council members have the courage to ignore the traffic safety deniers to make those changes. And automated speed enforcement, aka speed cameras, are currently illegal in California. Which is something that has to change. Thanks to Peter Flax for the heads-up. Great new video about how South LA’s East Side Riders Bike Club is using bikes to make a positive difference in the community, and maybe even break the color barrier in Olympic and pro cycling. And about founder John Jones III, who pays most of the expenses out of his own pocket. Seriously, take a few minutes to watch it. It may be the best four minutes of your day. CiclaValley informs us that the new 7th Street semi-protected bike lanes are proving popular as parking spots for Uber drivers. Parody Twitter account @realJohnBoehner forwards video of a British woman calmly removing a barricade, then driving through hundreds of runners taking part in a half marathon. A Hispanic man in his 20s was shot and killed while riding his bike in South LA early yesterday morning; police said there was no initial indication the killing was gang related. 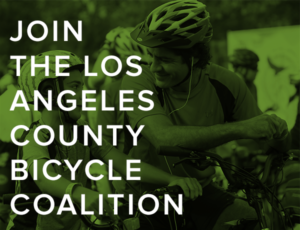 CicLAvia is hosting a community meeting in Panorama City tomorrow to discuss plans for the June 24th open streets event in the north San Fernando Valley. 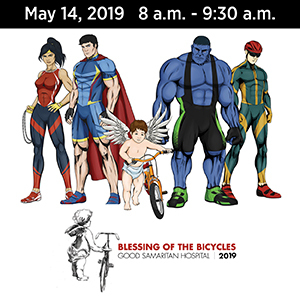 Pasadena police will be cracking down on traffic violations that endanger bicyclists and pedestrians this Friday and Saturday, even if they only endanger themselves. You know the drill, ride to the letter of the law until you’re outside their jurisdiction. Thanks to Megan Lynch and The Preven Report for the tip. Bike friendly Santa Monica continues to show Los Angeles how it’s done, as the city planning commission approves plans for a protected bike lane on 17th Street; their only complaint was that federal funding requirements mean it won’t be completed until 2021. Now the Santa Clarita Cycling Bear sculpture makes a little more sense, as the local paper explains more about it. Although I’m very disappointed that the bear isn’t actually riding a bike. San Diego is attempting to put a permanent stop to a DIY pump track in Ocean Beach by building housing on property that was originally deeded as a park for the children of San Diego. San Luis Obispo County bicyclists celebrate the completion of a road safety project that began in 1974. There’s a special place in hell for the driver who crashed into a four-year old girl as she rode her bicycle in Stockton last week, then drove off and left her bleeding in the street. A Redding driver complains about closing a little-used street to improve safety for a bike path because it will inconvenience him personally, and because he seldom sees a bike rider using it. Remarkable how many drivers take the time to perform bike counts while they zoom by. And how rarely bike riders happen to go by at that exact moment. Marketplace discusses whether Uber is disrupting itself by moving into bikeshare. A governing website explains why Seattle paid $3.8 million to build a one-mile bike lane, while the city’s protected bike lanes will cost $12 million per mile — four times the national average. And it ain’t because they paid too much for paint. Meanwhile, a Seattle website says the war on pedestrians is already underway, because ebikes are now allowed on sidewalks. Maybe they could cite the number of pedestrians killed by bicycles, electric or otherwise, and contrast that with the number killed by motor vehicles each year, and determine which one really poses a problem. Streetsblog Denver wonders why the local alternative weekly is pedaling anti-bike propaganda. A Houston sports writer offers ten tips for bicyclists and motorists on how to share the roads with each other, and pathways with pedestrians. Bizarrely, it’s apparently legal to park on a dedicated bike path in the Texas city. A Texas writer says safer streets will result in more people on bikes. Work on Detroit’s rapidly expanding bike lane network could go on hold as bike riders complain about poor design and a lack of maintenance on the city’s first protected bike lane. 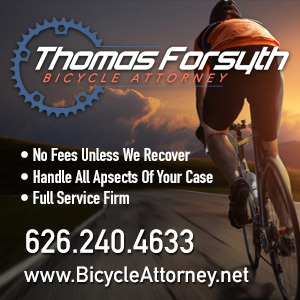 The road raging driver caught on video deliberately running down a cyclist on Tennessee’s Natchez Trace Parkway has copped a plea to significantly reduced charges that will result in just 10 months behind bars and three years probation. The conviction is credited to the crash being caught on bike cam, which put the lie to the driver’s ever-changing excuses. Thanks to Victor Bale for the tip. Delaware bike riders complain about a lack of safety, even on back roads. A Miami commissioner holds a “Dead Serious” meeting to reduce bicycling deaths. Toronto residents are still waiting after a newspaper declared it the Year of the Bicycle. In 1975. A study of 13 European cities reveals London is next to last in air quality, behind only Moscow, and is one of the most dangerous cities to walk or bike. The former may have a lot to do with the latter. Sad news from the UK, where a bike rider who was killed in a collision with a truck was still setting records at 86 years old, and belonged to the same bike club he founded just after after WWII. Horrifying story from Australia, where one of the country’s top masters racers died of ovarian cancer after falling under the influence of a self-described healer, who claimed to have cured cancer in hundreds of others. Caught on video: A Kiwi bicyclist captures a bus driver, who didn’t know the law, nearly merging into him. Followed by another doing the same thing. In a story that could have been written nearly anywhere, an Aussie writer bemoans the rise of the entitled motorist. It’s split results for Britain’s Yates brothers, as Adam Yates missed the Amgen Tour of California podium by two seconds, while his twin brother Simon continues to lead the Giro. And no, that’s not a spoiler, since the Giro had a rest day on Monday. Bicycling looks at a day in the life of a bike mechanic. Outside profiles the incredible Marianne Vos, calling her the greatest cyclist you’ve never heard of. Unless of course you have, in which case she may just be a greatest cyclist, period. Your next bike could cost less than 2,000 rupees, which works out to around 30 bucks. Co-existance on the roads is easier when bicyclists follow the rules they’d follow as drivers, if only drivers actually followed them. And this is why dogs should always wear helmets when they mountain bike. 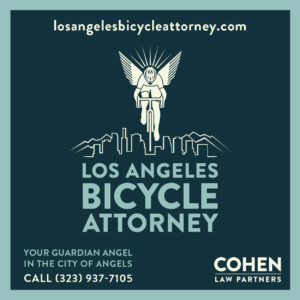 Thanks to LA bike lawyer and BikinginLA sponsor Cohen Law Partners for the link.